You are here: Home / Korg Digital Pianos / Korg G1 Air review: A High End Bluetooth Digital Piano? 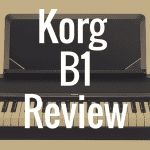 Korg G1 Air review: A High End Bluetooth Digital Piano? The Korg G1 Air is one of the brand’s CONCERT series Digital Pianos. This 88 key digital piano costs $2,199.99. With the G1 Air, Korg tries to recreate the experience of playing an acoustic piano. In this Korg G1 Air review, we’re going to discuss everything you need to know about this digital piano, so you can determine if it’s worth your money. And to better help you, please use the interactive table below, which allows you to compare the Korg G1 Air to other notable digital pianos. The G1 Air uses Korg’s real weighted hammer action (RH3) keyboard. The keys feel heavier in the lower register of the G1 Air and lighter in the higher register, which replicates the feeling of playing on the keyboard of an acoustic piano. The inclusion of a weighted hammer action keyboard in this digital piano adds a level of realism to the Korg G1 Air and will make it easier for players who start their piano-playing journey on this instrument to eventually adjust to playing an acoustic piano. The RH3 keyboard is also extremely responsive to the player’s touch and captures all of the dynamics of the musician’s playing. The G1 Air also provides key touch control, which lets players determine just how much their dynamics will affect the keyboard’s sound output. Players can choose between light, normal, heavy, stable, and fixed key sensitivity. These five key sensitivity settings let musicians truly customize their playing on the Korg G1 Air and lets them control the dynamics that come out in their music. The RH3 keyboard is not the only way in which the Korg G1 Air attempts to replicate the experience of playing an acoustic piano. This Korg digital piano simulates the string resonance inside of an acoustic piano. The strings inside an acoustic piano resonate along with those of corresponding pitches as the damper is lifted; this resonance is an integral part of an acoustic piano’s sound. The string resonance simulation in the G1 Air adds another layer of realism to the playing experience and lets musicians somewhat recreate the sound of an acoustic piano at a fraction of the price. This digital piano also recreates the damper resonance that is produced by the strings inside of an acoustic piano when the damper pedal is held down. Like string resonance, damper resonance is integral to the sound of an acoustic piano. 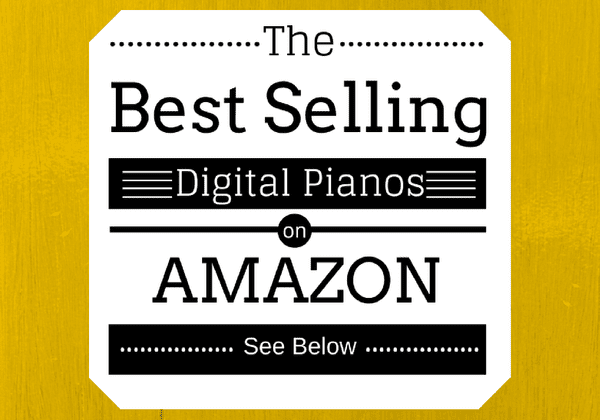 Below, please take a moment to view some of the best selling digital pianos available on Amazon (and see how well they stack up to the G1 Air as you progress through this review). The G1 Air uses key-off simulation to recreate the sounds that are produced when a player lifts their fingers off the keys of an acoustic piano and the hammer’s inside the piano move off of its strings. 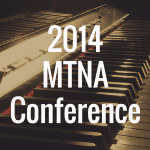 Again, these subtle sounds add to the character of an acoustic piano’s sound. By combining the key-off simulation feature with string resonance and damper resonance, the Korg G1 Air comes closer to recreating the experience of playing an acoustic piano than cheaper digital pianos likely will. Of course, the quality of the onboard sounds is the most important factor to most people who are buying their first digital piano. The Korg G1 Air has 32 sounds, and three of those sounds are grand pianos–the German piano, the Austrian piano, and the Japanese piano. The German piano features a rounded low end and a brilliant high end, the Austrian piano has a warm and brilliant sound, and the Japanese piano has a dynamic sound and is suited for a wide range of musical genres. These grand piano sounds and all of the other sounds are developed with Korg’s attention to detail and quality, so they are sure to appeal to even some of the most discerning players. Thirty-two onboard sounds is not an incredible offering of sound variety, but it will likely suffice for beginner players, especially those who only intend to use their keyboard’s piano voices. The Korg G1 Air includes three levels of brilliance, chorus, and reverb effects that players can use to customize the sound of their playing. Brilliance lets musicians make their playing sound brighter and sharper, chorus adds a shimmering quality to the music (especially when playing long, sustained passages), and reverb recreates the sound that would be produced when playing in different spaces. For example, the digital piano’s sound output would sound much different in a spacious, empty auditorium than it would in a cramped studio apartment; reverb helps players to let their playing fill a space or recreate the sound that would result in an entirely different space. The G1 Air has 120-note max polyphony. With this amount of polyphony, players can apply the three included effects to their playing and can play intricate chords and complicated runs without worrying about note dropout. A polyphony of 120 is a good working polyphony for the average player. There are digital pianos around this price that offer more polyphony, however. Having more polyphony would certainly leave more room for a musician to grow, but 120-note polyphony will sustain players through their beginner and intermediate phases. 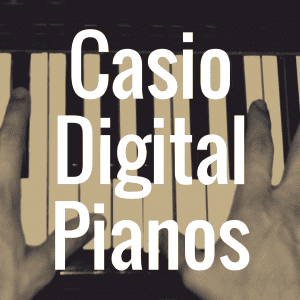 This digital piano includes a full complement of the three pedals that are found on an acoustic piano, the damper, soft, and sostenuto pedals. The damper and soft pedals are built with half-pedaling capabilities, which allows for a level of expression that is pretty close to that of an acoustic piano. Split mode, layer mode, and partner mode are all offered on the Korg G1 Air. Split mode allows players to split the keyboard between two voices; for example, a piano voice can be used in the digital piano’s upper register and can be accompanied by a bass voice in the lower register. Layer mode lets musicians layer two sounds together, like a combination of a piano and strings. Partner mode makes it easy for beginners to play along with their piano teacher, a family member, or a friend. In partner mode, the keyboard splits into two identical halves so that players can hear exactly what the music should sound like as the other person plays it and then follow along when they are ready to do so. Partner mode completely eliminates the need for awkwardly shuffling on and off the bench during demos and explanations. With partner mode, musicians can rapidly learn and develop their piano-playing skills as they practice alongside a more experienced player. The Korg G1 Air has a built-in two track recorder. The inclusion of this recorder makes it possible for players to record practice sessions or song ideas directly onto their digital piano. The G1 Air lets players store up to 99 songs, which is quite impressive. 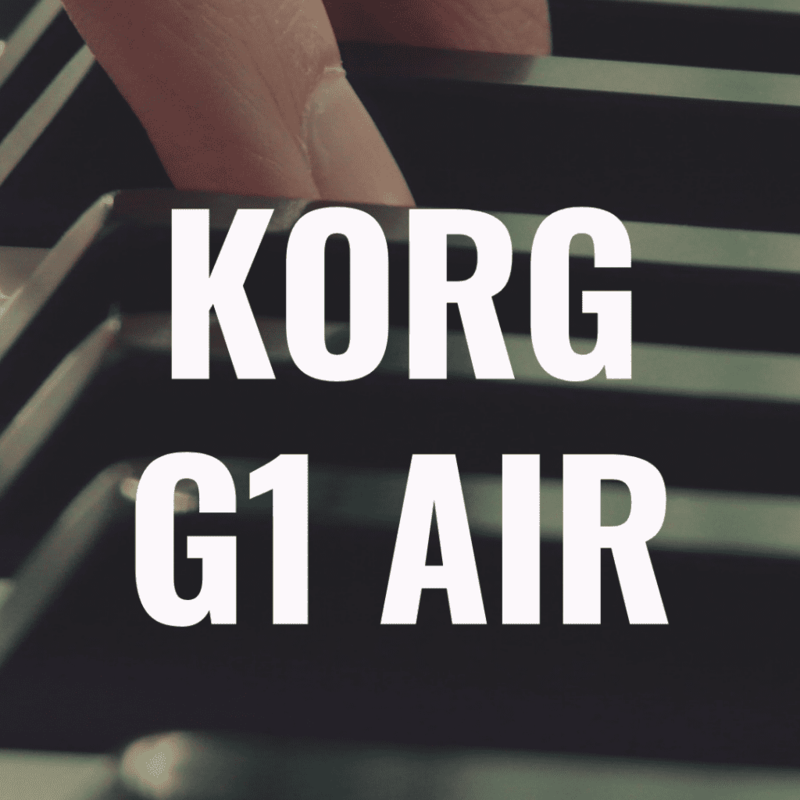 See what keyboardists are saying about the Korg G1 Air here. The Korg C1 Air has many of the same features as the G1 Air, but at a lower price of $1,699.99. One of the major differences is that the C1 Air does not have the Austrian Piano sound that the G1 does. However, it has the exact same German Piano and Japanese Piano sounds. Both of these digital pianos are built with an RH3 keyboard, so the C1 Air has the same heaviness in the lower register and lightness in the upper register as the G1 Air does. Damper resonance and key-off simulation help the C1 Air to recreate the subtle sounds of an acoustic piano like the G1 Air does, too. The C1 Air has 30 onboard sounds, which is not much different from the G1 Air’s offering of 32 sounds, especially considering the price difference between the two instruments. This cheaper Korg digital piano has 120-note polyphony, too. Again, players may eventually find themselves looking for an instrument with more polyphony. Spending $1,699.99 on the C1 Air and buying another digital piano later down the line may be easier to stomach than upgrading from the $2,199.99 G1 Air, however. Both digital pianos have three levels of chorus, brilliance, and reverb, so the C1 Air’s sound output is just as customizable as that of the G1 Air. The C1 Air also has a two-track recorder and a full complement of pedals. The Korg C1 Air is a great cheaper alternative to the G1 Air. There are not many important differences between the two instruments, so the C1 Air is excellent for people who want the sound and feel of a higher-end instrument at a more affordable price. 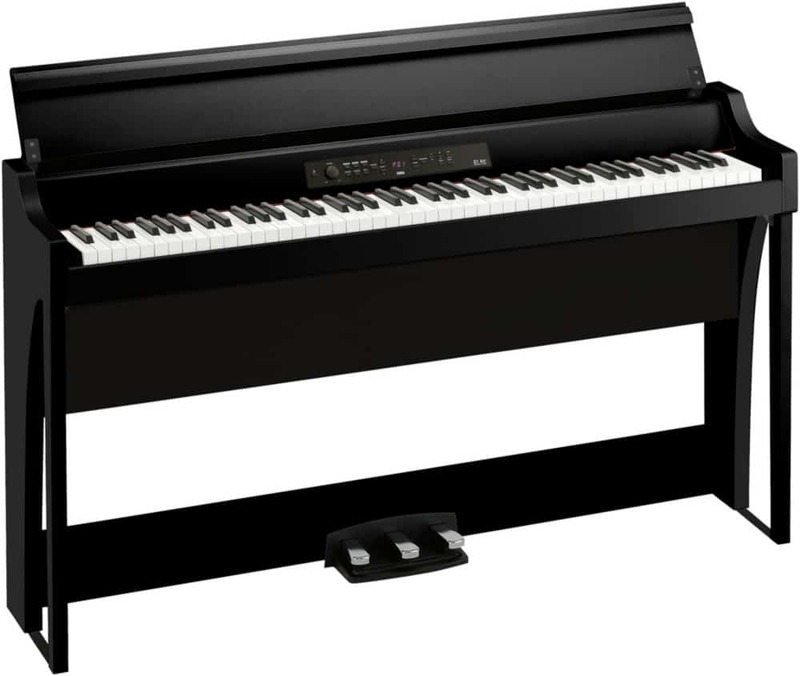 This digital piano is built with the same quality as the more expensive G1 Air and includes lots of the same features as the G1Air. The C1 Air would likely appeal to beginners who want a high quality digital piano without spending over two thousand dollars on an instrument. Learn more about the Korg C1 Air here. Kawai attempted to achieve a high level of authenticity with their Responsive Hammer III keyboard action, which is a graded keyboard like Korg’s RH3 keyboard. The keys feel heavier in the low end and lighter in the high end. The Kawai ES8 has let-off simulation (the same function as Korg’s key-off simulation). A major difference between the keyboards on the two Korg models and the Kawai ES8 is that the Kawai model uses counterweights on each key. In an acoustic piano, counterweights help to make the piano’s sound more weighty when the player presses the keys forcefully and lighten the sound when the player plays pianissimo passages. By including counterweights, the Kawai ES8 comes a little bit closer to recreating the feel of an acoustic piano’s keyboard than the Korg C1 Air and G1 Air do. The Kawai ES8 has 34 voices, which is not much of a step up from the G1 Air’s 32 voices. The three standout sounds on this digital piano are reproductions of Kawai’s SK-EX and EX concert grand pianos and a reproduction of their SK-5 chamber grand piano. One significant difference between the Kawai ES8 and the Korg G1 Air and C1 Air is that this digital piano has 256 note polyphony. As such, the Kawai ES8 is capable of supporting more effects, more advanced and intricate chords, and can handle glissandos and other advanced piano-playing techniques. Musicians who choose this Kawai digital piano over the Korgs included in this article are less likely to have to upgrade to another digital piano because their current instruments polyphony no longer supports their playing. The Kawai ES8 offers more effects than both the Korg G1 Air and C1 Air. 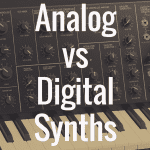 With these effects, players can customize their digital piano’s sound output much more than the Korg models’ chorus, brilliance, and reverb allow. The Kawai ES8 is a great choice for keyboardists of all skill levels. With more polyphony and effects than the Korg G1 for less money, this digital piano is a great choice for those who are looking for a digital piano that they can be proud of for years to come. Find out more about the Kawai ES8 here. 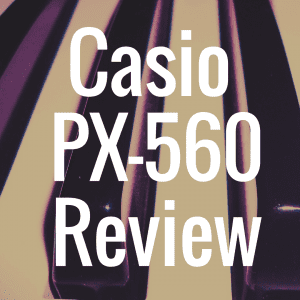 At $1,499, the Casio AP-470 is the most budget-friendly digital piano of those included here. This digital piano has 22 onboard sounds, two of which are grand piano sounds. These sounds are created with Casio’s AiR Sound Source. 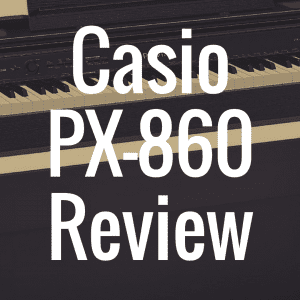 Still, this is the lowest number of onboard sounds of all the digital pianos included in this article, so this Casio model may not appeal to those who look forward to experimenting with a digital piano’s various sounds. The Casio AP-470 has a tri-sensor scaled hammer action keyboard, so it has much the same feeling as the Korg G1 Air, Korg C1 Air, and Kawai ES8. All of these keyboards feel heavier in the low end than in the high end. Like the Korg C1 Air and G1 Air, the Casio AP-470 simulates an acoustic piano’s sympathetic string resonance and damper resonance. This digital piano has 256-note max polyphony, so it can support advanced playing as well as the Kawai ES8. The Casio AP-470’s effects offering is closer to that of the Korg G1 Air and C1 Air, however. The AP-470’s effects include hall simulator, chorus, and brilliance. The Korg G1 Air earns 4 out of 5 stars. The grand piano voices are highly acclaimed by many reviewers, so buyers of the Korg G1 Air can rest assured that they are getting an instrument with great sound quality at a reasonable price. However, this instrument only offers 32 onboard sounds and there are other digital pianos out there that have a much wider sound offering. The G1 Air’s 120-note polyphony will suffice for beginner and intermediate players, but as musicians progress in skill they may find that they require an instrument with more polyphony as their musical needs change. The G1 Air comes with a full complement of pedals, and that is definitely a plus. The included pedals keep keyboardists from having to purchase pedals on their own. Overall, the Korg G1 Air is a quality instrument that musicians can be proud of having in their digital piano collection. The Kawai ES8 offers players the most value. With more max polyphony than the G1 Air, the ES8 can support players at the beginner, intermediate, and advanced levels. As such, keyboardists are less likely to have to upgrade to an instrument with more polyphony as they advance in skill. The Kawai ES8 also includes the most built-in effects and onboard sounds of any of the digital pianos mentioned here, which makes it easier for musicians to customize their playing and to explore what their music sounds like when played in different voices and with multiple sound effects. Still, all of the digital pianos included in this article are built with an attention to both quality and detail, and musicians can look forward to countless hours spent playing any of them.